Owner & Operator of Paris Painting in Minneapolis, Minnesota. which is estimated to pass +$3 Million in sales this year. 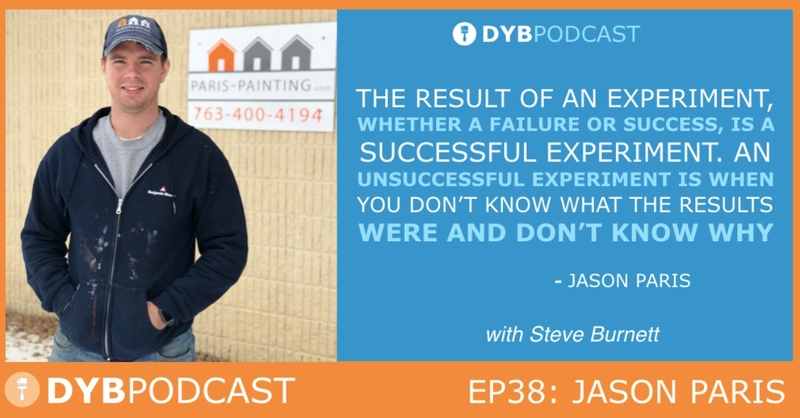 As a young founder at the ripe age of 30, Jason has gained a lot perspective on leading & growing a team of millennials through the years, as well as the amount of opportunity in the trades. Enjoy this episode as both talk culture, tech, and the future of painting! [9:57] Why was 2015 the most difficult year in terms of growth for Paris Painting? [21:49] What is Jason’s vision for the company? [30:38] What is Jason’s company values? [33:50] What has been Jason’s biggest paradigm shifts that led to his success?